Due to weather delays, the Lost Valley Area of Buffalo National River is expected to remain closed until early April to allow contractors to complete the site improvement project. The National Park Service closed the Lost Valley Road and day-use area in December. The closure was made to relocate a portion of the Lost Valley Road, parking area, and trailhead out of the immediate flood zone of Clark Creek. The purpose of the project is to provide safe vehicular access to the Lost Valley Trailhead, while minimizing adverse impacts to Clark Creek, the Buffalo River, and the surrounding environment. Lost Valley is a point of interest located at the western end of Buffalo National River near the town of Ponca. It is one of the most popular destinations at Buffalo National River, receiving approximately 77,000 visitors per year. The Lost Valley area features a heavily-used hiking trail, picnic area, amphitheater, pavilion and restrooms. When complete, the improvements are expected to have a beneficial impact on water quality and species of special concern due to the reduction in the sedimentation of Clark Creek and restoration of riparian area. The improvements should also have a beneficial impact on visitor use and experience by providing more sustainable access and parking. 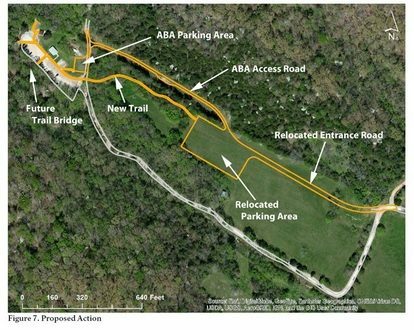 The Architectural Barriers Act-accessible portion of the existing Lost Valley Trail will also be repaired, which should drastically improve accessibility for visitors with limited mobility. The pedestrian bridge across Clark Creek will be constructed in the near future as part of a second project phase. This is one of several public transportation projects at Buffalo National River to be funded by the Eastern Federal Highway Program. Federal Highway Administration officials awarded the project bid to Kovilic Construction Co., Inc. of Franklin Park, Illinois. More information about the project is available by clicking here. Until improvements are complete, the entire Lost Valley Area is closed to the public. Nearby alternatives for day hiking include the Buffalo River Trail, Beaver Jim Villines Homestead Loop, Hideout Hollow Trail, and Mill Creek Trail. Click here for detailed maps and descriptions of these alternatives. 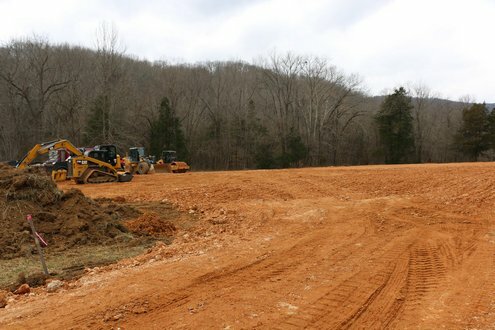 NPS photo: Dirt work for new Lost Valley parking lot (looking toward Clark Creek and existing entrance road) as of Feb. 3rd, 2019. 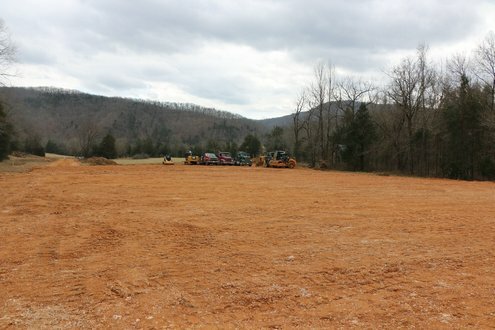 NPS photo: Dirt work for new Lost Valley parking lot (looking toward Hwy. 43) as of Feb. 3rd, 2019. 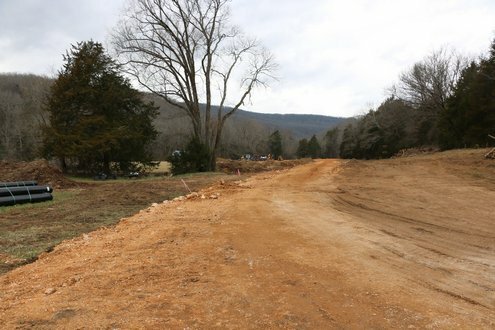 NPS photo: Dirt work for new entrance road re-route as of Feb. 3rd, 2019.